AMS-Merlo has 18 model lines available for 2018. This month, we continue our series of available Merlo models with the Roto line of telehandlers. Rotos are unique to the heavy equipment industry as they offer versatility in site work that would normally require several pieces of equipment. Packed within every Roto’s compact footprint are a 360-degree slewing turret, independent and jacking stabilizers, and capacity to lift and move loads at height. 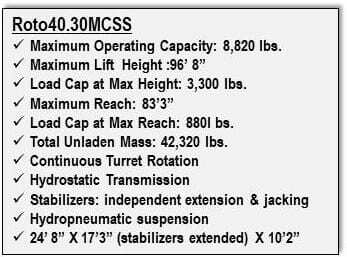 Roto MCSS models have turrets that continuously turn 360 degrees, with the boom at height as needed. The continuous rotation enhances machine performance and speeds up handling operations as the turret does not need to come back to the start position. All the electronic and hydraulic lines are enclosed within the boom itself, and it is engineered to have no flex; the boom will not ‘banana’ out. Also, Rotos quickly adapt to a variety of attachments including manbaskets. Mounting and locking operations of the Tac-Lock system are controlled from the cab. 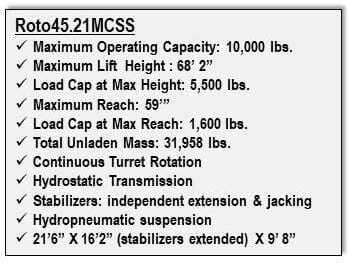 Facts about Roto 45.21MCSSDepending on the model, Roto lift heights range from 68’ to 96’, with a reach from 58’ to 83’. Maximum operating capacities range from 8,820-10,000 lbs. Safety is not an option with Merlo. Safety features include self-leveling hydropneumatic suspension, hydrostatic transmission (Rotos can travel up to 25mph), load sensing hydraulic pump, headlights installed on the turret, and two real-time safety systems: MerLIN (Merlo Local Interactive Network) electronic machine management program that displays the center of gravity position of the machine and how it moves, and Merlin Continuous Slew Safety (MCSS) system which automatically and continuously checks the forces acting upon the four independent stabilizer pads. The four stabilizers can be configured to suit the type of terrain and slope of the job site. Thanks to the MCSS system, Rotos can also operate with the stabilizers only partially extended. 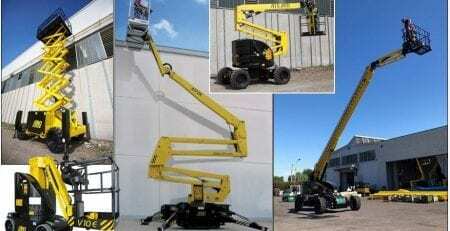 This allows for working close to curbs, walls and within narrow spaces. Rotos, with all this powerful versatility, are surprisingly compact. A Roto’s real estate covers (LxW) 26’8” x 8’2”; with stabilizers extended (W) 17’3”. The new modular design enhances Merlo’s commitment to operator comfort and safety. Merlo cabs have a 360-degree view, including excellent upward visibility, and superb sightlines across all interior control panels. The cabs, still the widest in their class, are engineered with special mounts to reduce vibration. Seats offer independent suspension, and the split door opens a full 180 degrees. Merlo engineers redesigned the air venting and filtration system for better airflow quantity and quality. Overall, the new cab optimizes an operator’s comfort, efficiency, and safety. 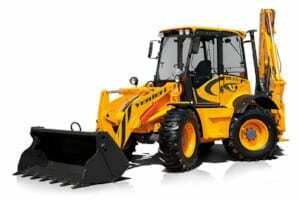 VF Venieri specializes in the production of small and medium-sized wheel- and backhoe loaders for earthmoving, industry and agriculture. 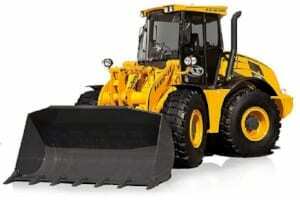 Applied Machinery Sales expects to take receipt of its first shipment of Venieri wheel- and backhoe loaders this summer. Since that first tractor rolled off its assembly line in 1948, Venieri continues to influence the world market with constant research for innovating technical solutions that are oriented to safety, reliability, stability, performance, operator comfort, and permanent technological developments. 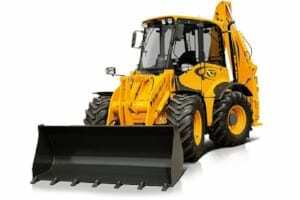 Their excavators are known for withstanding continuous operation with minimum downtime. Venieri is proud of its innovative manufacturing processes and attention to the quality of each machine. All machines are built with the most reliable material. Venieri engineers monitor every single stage of production and ensure assembly of each machine is entrusted to a specialized technical team. This team is fully responsible to the customer, and the company, for the final end product. This process is guaranteed and certified as per ISO 9001-VISION 2000. By adding Venieri, Applied Machinery Sales expands its mission to bring top quality earthmoving and material handling equipment to the United States marketplace. Model specifics will be announced this summer. Can’t wait until then? Please give us a call at 803-327-4949.